Memorial Day Pool Party Kick off with Trina Turk and Chandon! What an AMAZING night it was celebrating Chandon’s American Summer Pool Party with Brittany Snow AND Trina Turk!! Trina Turk, who is famously synonymous with colorful summer prints and luxuriously feminine pieces, celebrated with an exclusively designed collection, including the cutest dress, inspired by the limited edition bottle. With an expertly executed homage to our patriotic Red, White and Blue and the nautical theme of the night. Wearing this dress, you’ll be ready to celebrate! Trina gave me the exclusive scoop on what her favorite makeup look is for the season and what she thought would be the trend setting look to go with the Chandon design inspired dress! * Bronze : Wash bronzer across the face for the perfect glow. Sweep Bobbi Brown’s “Face and Body Bronzing Duo” across your face. With soft strokes start on your forehead and create a “C” curve from the middle of your forehead and sweep down your hairline to just below your cheek bone.Repeat on each side and blend. Next define your jawline with the same “C” curve outlining your jaw and gently blend down your neck. Wha-La! Glowy, fresh, naturally bronzed skin! * Natural Lip : Create a defined lip with a neutral shade that is one degree darker than your natural lip tone. Makeup Forever’s “Aqua Lips” in shades 2C (light), 3C (medium), or 6C (dark). Lightly trace and fill in your lips, then apply your favorite lip balm on top for an ultra moisturizing, lasting look. Another one of my favorites: Fresh’s “Lip Sugar” in Honey or Plum to deliver a maximum moisture treatment with an spf and subtle tint. * Mascara : Define your eyes with the simplicity of fabulous lashes. Maybeline’s “Full n’ Soft”- one of my absolute favorite’s- for an all natural fluffy lash look or try top rated Maybelline “Volum’ Express Mascara The Mega Plush” in Blackest Black, plumps with soft supple volume that is also gentle on your lashes with it’s new gel-mousse formula! Honestly there’s no better to way sip in style and indulge in opulent spirits. Sweet, tart and saucy, that’s the way I like mine…My Cocktail, that is! Whether sipped in its perfect simplicity or mixed in one of Chandon’s expertly mixed cocktails, you can’t go wrong. My favorite of the night, ….the “Cabana Boy“…Say What! MMMHMMMMM! Oh yes, with Chandon Riche, St. Germain and fresh Pomegranate Seeds these really made this cocktail my favorite! Now that we have our cocktail and a sensational look to sport…who’s up for the beach! by Peg Samuel with Lexi Tabback. With “the essential guide for the girl about town”, these Social Diva’s help you solve the little and not-so little dramas of wardrobe crisis, accessory calamity, hair malfunction & more! 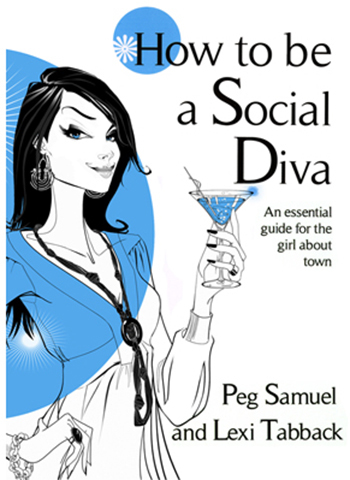 All the essential instructions on how to truly embody being a Social Diva! the TOP industry insiders by Winning! Email Vanessa at ASKVANESSA@VANESSAELESE.com (or contact her at www.vanessaelese.com) sending the One Nagging Beauty Question you’d LOVE Vanessa to answer!! The first 25 to SIGN UP for “The Beauty Fairy Diaries” and ENTER your question will be selected to win this fabulous promotion & Beauty Fairy First! 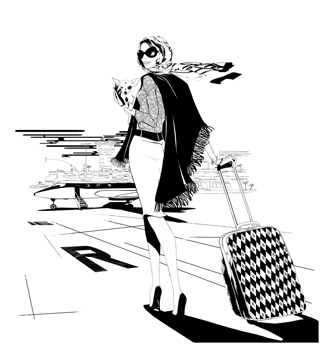 START THE NEW YEAR WITH A HEAD START TO RULING THE WORLD AS A … TOTAL DIVA!